We hire the best to get the best results. We want you to feel confident about who works on your Subaru whenever you bring it in for service. The technicians on our Factory Trained Teams have earned certification through specific training programs developed by Subaru of America, Inc. to properly diagnose and service the various components and technology that are unique to Subaru vehicles. This ultimately helps ensure the safety and performance of your vehicle when it leaves our doors. 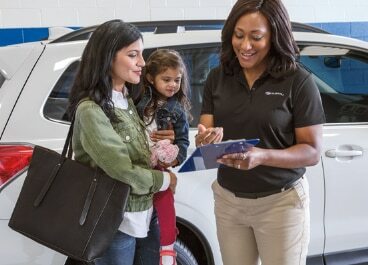 So, whether you visit us for regular scheduled maintenance or an extensive repair – your Subaru will be in the hands of those who know it best. Meet Our Factory Trained Teams! Learn more about the ones who care for your Subaru. Subaru Master Technicians: The highest level of service care. Interested in a career as a Subaru Technician? Subaru-U is a partnership program dedicated to working with select National Automotive Technicians Education Foundation (NATEF) and Automotive Youth Educational Systems (AYES) secondary and post-secondary schools, along with Subaru retailers to develop future Subaru technician employees. Students can take basic training, or advance their previous training through web-based and instructor-led courses to gain the required knowledge to properly service Subaru vehicles. Have a passion for the Subaru brand and looking to pursue a career in automotive repair? Click the link below to view our open positions!